Ireland and Ulster star Rory Best wants to hang up his boots on his terms - leaving but still wanting a bit more. The 36-year-old talismanic figure in both the white jersey of Ulster and green of Ireland, is set to end his international career at the end of the Rugby World Cup later this year in Japan. 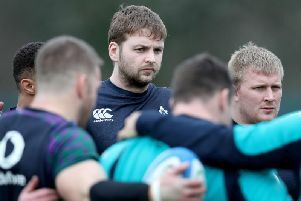 The current skipper of both country and province is still pondering his Ulster future - although talks with Kingspan Stadium bosses have not yet commenced. Best has given 15 seasons to Ulster already, reaching 216 caps against Munster two weeks ago. Taking a short break with his family in Dubai, it gave Best an opportunity to take a breath and actually reflect on what was a massive 2018 for him personally. As for the future he admits to enjoying playing too much at the minute to want to think about it coming to an end. There had been speculation Best would stay on with Ulster after his international career ends, taking him up to June 2020. But Best also accepts he does want to try and over cook things either. “I will just see how I am going, I do not want to flog a dead horse,” Best said in an exclusive interview with the News Letter. “I am enjoying playing at the minute, I am playing well, but I do not want to get to the position where, and I have seen it in Ulster, with some other players who went on too long and did not go out on their own terms. “I do not think that I am the sort of personality who will give up or just one day decide I am just going to hang in here and pick up the cheque for the rest of the season. If this is to be the final or penultimate season, Best would certainly like to be lifting a trophy with Ulster. Lifting the Six Nations Championship - a Grand Slam by the Irish - was his choice of the highlight of a year which also saw Ireland defeat New Zealand on home soil for the first time. “I have never ever lifted a trophy as a captain at any level, I do not think, and it was not a bad one to start with,” said Best. “The whole week was strange, especially after Argentina, I have never been in a Ireland team where we have beat a Southern Hemisphere team by more than 10 points or so. “Outside of that there was still this expectation you were going to win, which from an Irish point of view would have been a first to have had that. “Everyone feels you have a good chance. That built, but when we went into Dublin on the Thursday, the whole place, all everything everyone was talking about was this game. “You would get little lulls and then something would happen and the place exploded - the atmosphere was unreal, it was amazing,” added Best. Having beaten Italy, Argentina, the All Blacks Best watched on as Ireland closed out a complete sweep in the November Test series with a win over USA - finishing an international season which had seen only one loss to Australia during another first - defeating the Wallabies 2-1 for the first time in their own back yard in a Test series. The win over New Zealand was the perfect way for Best to sign off. Add in receiving an honorary doctorate from Queen’s University, the freedom of the Armagh, Banbridge and Craigavon Borough and an MBE from Prince Charles at Buckingham Palace, 2018 will be a hard year to repeat. Best’s return to Ulster duty saw the side lift themselves for some big performances against Scarlets twice in Europe and Munster in the Guinness PRO14 derby. It saw the Province move into 2019 second in their Pool in the European Champions Cup and with a realistic opportunity of progressing to the knockout stages and also sitting second in Conference B of the PRO14. And those recent performances are what keep Best wanting to keep on going in spite of knowing he still has to think about post October. “I suppose I just keep thinking or wondering if I get to the point when I am not really enjoying it,” he explained. “Every time I think I might be getting to that point, something happens at Ulster, like those back to back games (against Scarlets), in fact the whole month of December, the Cardiff game, the Scarlets and that Munster game to finish. As for the season ahead, Best wants to see Ireland perform at the Six Nations and World Cup. “If we can show we can perform and perform well and if a little bit of bad luck goes your way, or you lose a game by some unbelievable play by another team or a referee’s decision, we will then know that under pressure and expectation we can still perform. That is the case for this squad anyway. And as for Ulster, Best was in the starting team which lifted the Celtic League title in 2006 and he probably yearns, in what is potentially his last term as skipper, to be collecting some silverware this season. “It has been a long time since that 2006 success in Swansea. It has been a long career and a lot of caps not winning something. “I would love to win something with Ulster before I retire, but you also have to be realistic. “This current group are on a journey and if we happen to get there sooner, then brilliant, but I think it will take a bit more time. “Unlike the Michael Lowry’s and James Hume’s, I do not have the same amount of time. “At the same time you do not want them falling into the same trap as we did 10 or 12 years ago, having come so close in semi-finals and finals and saying there is always next season.